Author, Gordon Strong, three time Ninkasi Winner at the National Homebrewers Conference takes you on a homebrewing journey. 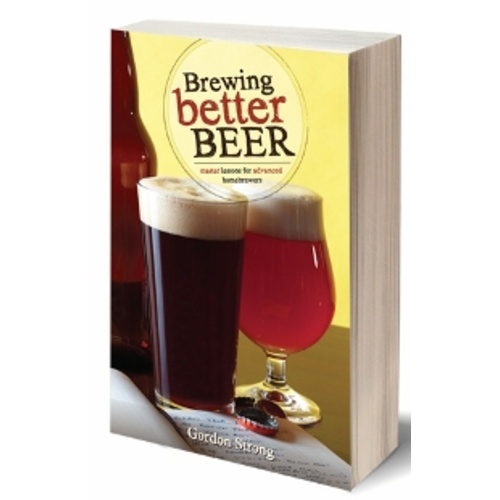 Brewing Better Beer is a complete book how to brew great beer at home and win in competitions. A comprehensive format that includes tips, hints, examples, techniques, and recipes. Brewing Better Beer is the one book experienced homebrewers need to up their game. Gordon won the Ninkasi Award in 2008, 2009, and 2010. "Preparing for a homebrew competition helps you make better beer because it causes you to focus on what the judges will evaluate. So you have to optimize your brewing for the best consumer experience. If you can present a beer that will wow the judges, you can certainly have good beer on tap all the time at home." "I really appreciate a good American Pale Ale. I think it's a good mark as to the brewer's skill since it's so straight-forward. It also can have a wide range of interpretations, so it does allow for some brewer creativity." "I'm a Grand Master beer judge and the current president of the BJCP (www.bjcp.org). I firmly believe that becoming a beer judge is the single best thing a brewer can do to improve their beer since it helps you understand and evaluate your own products. It causes you to think about how the ingredients and processes result in what's in your glass, and to diagnose potential problems." For myself only brewing around a year and half. I stepped up to all grain and was looking for that next step and this book was it. If you have everything you need for all grain and just need to work on your process and recipes then this book will help you out a ton. It is like a personal lesson on basic all grain equipment. If you've been doing this awhile, then I recommend this book. I really enjoyed it, but I don't think a new brewer should jump into this yet. If you already have brews under your belt, then this is the book for you. Takes you to the next level of brewing and explains why/how. Great read for adjusting water and more complex mashing.